Dauphin is a typey son of the legendary Donnerhall from an outstanding damline developed at Groenwohldhof where his sire stood for breeding. Marefield Meadows, his breeder, was fortunate when Dauphin was invited to join 49 other colts in the 11-Month Stallion Performance Test at Adelheidsdorf. 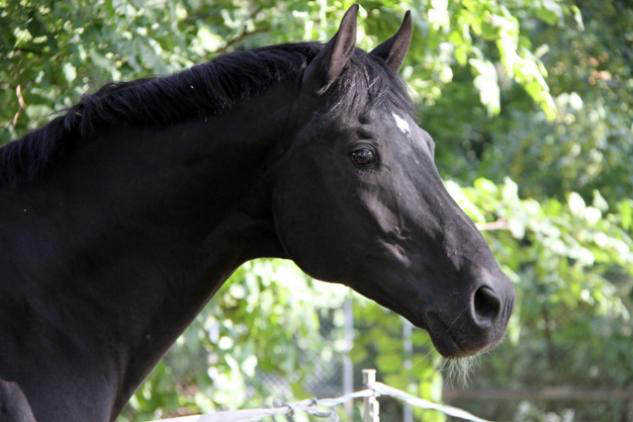 He was the only privately-owned stallion of the group. The German breeders who followed his progression were favorably impressed with Dauphin's swinging back and happy attitude, saying, “For him it's like play; the riding is a game to him.” He was also praised for his kind nature and good manners. 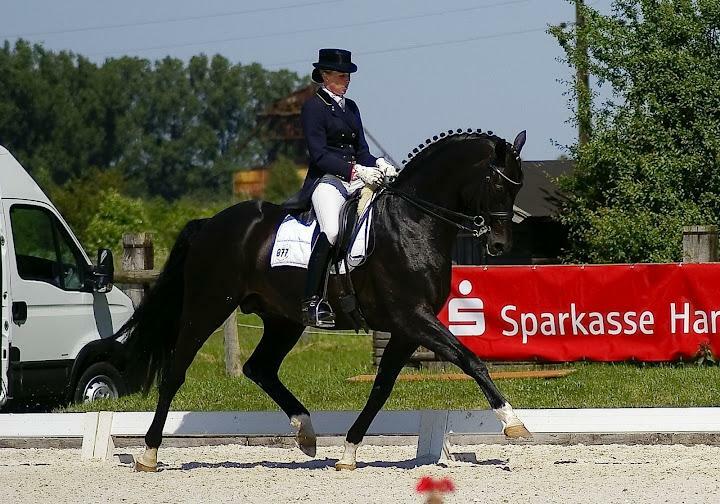 Dauphin finished the test in fourth place and was invited to remain at Celle on breeding lease. 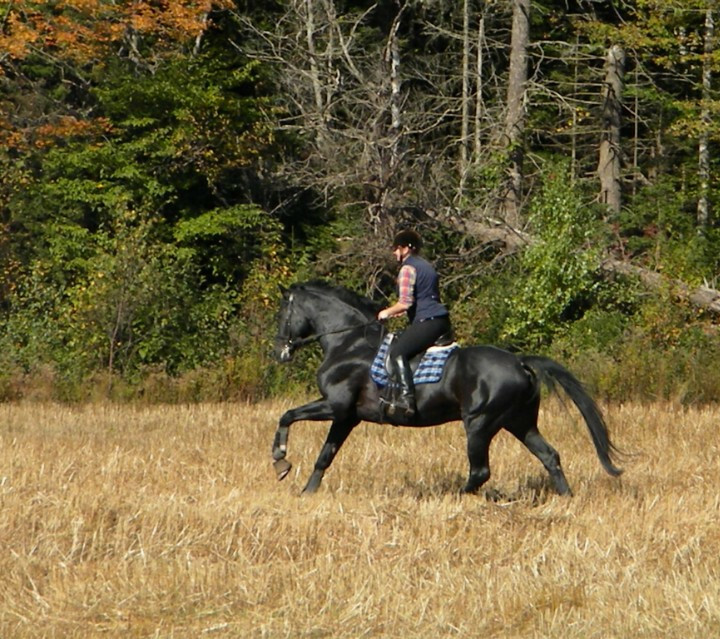 Dauphin has been an outstanding producer of character, rideability, willingness, correctness and movement. He passes his exemplary conformation, type, and wonderful disposition onto his offspring. 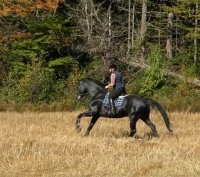 He tends to be a refiner and produces rideable dressage horses in the 16-16.2hh range. 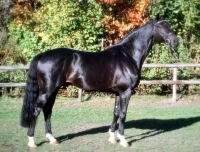 He has produced 489 German Hanoverian offspring as of the 2015 publishing of the Hanoveranner Hengst Book. Of the 102 mares that are in breeding, 28 of them were awarded the coveted States Premium Title. His two approved Hanoverian sons, Dallmeyer and Don Presidente are continuing to carry on this line. Dauphin is on the Top List of the Hanoverian breed for type with an outstanding score of 132, and a 143 for his limbs! He is black but can produce chestnuts. Dauphin is also approved with CHS, GOV, CWHBA, and CSHA. Foals from KWPN-NA mares will be eligible for registry “A” papers. Foal Championships. 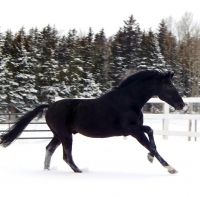 He has brilliant, basic gaits and an outstanding rideability. Schwarzenegger has placed at Advanced Level dressage competitions and, in 2007, was victorious at various Advanced Level dressage tests. 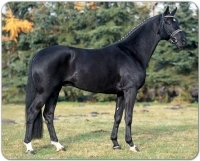 He has competed at Intermediate I and has trained up to Grand Prix. Schwarzenegger has been on the top list of jumper producers for the Hanoverian Verband for the last four years. Schwarzenegger would be a great cross for both dressage and jumper breeding programs! We look forward to hearing from you! Approvals: AHS, HV, CHS, GOV, CWHBA, and CSHA. Foals from KWPN-NA mares will be eligible for registry “A” papers. Approvals: AHS, HV, CHS CWHBA and CHSA.